We have things. Lots and lots of things. And as we’ve gotten older and made more money, purchased a home and gotten steady jobs to support all these things, we’ve realized that simply having these things is exhausting. Little by little we are trying to live a better life with less. It’s liberating most of the time, but occasionally we bump up against getting rid of things that are really hard to part with. We recently decided to part with one of those more difficult things. Our music collection. As a kid I didn’t have much of an ear for music, but then I got to college and people started introducing me to everything. I went from knowing a lot of James Taylor, the Indigo Girls and Tom Petty to actually being exposed to what my peers were listening to. I started listening to the radio. People noticed my void of music knowledge and started to try to fix it, burning me CDs, lending me albums, making me mixes. When I got my first car as a junior in college my friend made me a driving mix and my memories of that summer are filled with Grant Lee Buffalo’s voice. Whenever I hear him even now his voice just sounds like independence and sunshine. Later, prior to asking me on a date, some guy gave me a mix CD based on a song he’d heard in my car when I gave him a ride home from class one night, even though my ‘89 BMW only had a tape deck. Then I met Regan and he made me a mixtape in a specially designed cassette case. I got hooked on Spoon and The Doves, James, Hot Hot Heat and Karate that spring. 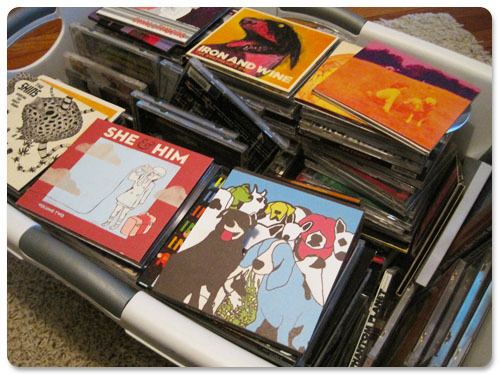 Then a year after we started dating we merged our music collections. My Dar Williams and Modest Mouse got mixed in with his hip hop. Then we started building our music collection together. We spent summers listening to new artists and seemed to spend winters listening to the old stuff. We went through a phase where we’d head to Luna Music on Sundays and get double stamps on our customer card, looking forward to the day we could show up with a fully stamped card and get a free album. Peeling into our new albums each Sunday we’d eagerly pop them into the player in the car. I’d read the lyrics and liner notes while Regan drove us on mini-adventures. Then somewhere along the line we noticed that we had more stuff than we wanted. We started buying less of everything. We slowed down our trips to the music store. We started downloading most of our music instead of buying albums and our collection of CDs, with nowhere else to go, sat in a tub in Regan’s closet. We occasionally raided said tub to find a bit of nostalgia — maybe my Godspell soundtrack from high school or maybe Regan would grab a handful of hip hop to take with him on a drive somewhere if I wasn’t going along. But we largely ignored that pile of good music sitting, hidden away. Some was burned on my computer, some on his. Portions of our collection were on our iPods, but physically sifting through our music collection, looking at the album art, reading the liner notes — all of that just went away. So we decided that if we weren’t taking advantage of having something then maybe we should get rid of it. Not the music, of course, but the physical object attached to it. So Regan took our collection and transferred it all to our computer, backed it up, and then we got ready to give our music collection away. But first we had to wait. It sat on the floor in stacks for a while. We’d walk through his office, look at it and say, “We really need to get rid of that soon.” Then we’d wait some more, delaying as long as we could. But this weekend we decided to just get it over with. When we arrived with our clothes hamper of music, the staff at Half Priced Books swarmed in and sorted it, commented on it, got kind of excited by it. They gave us a lovely wad of cash for it all and I wanted to happily walk out the door and just feel lighter, but somehow I just felt as though I’d left something behind. I kept thinking that maybe I should have kept Aimee Mann’s Lost in Space Special Edition because I remember how happy I was buying it with Regan, or maybe we should have held onto The Format’s Dog Problems because, really, I just like to look at the album art. Give me a week and I’ll be entirely over it and not give it a second thought, but right now I’m just kind of mourning the loss of a bunch of stuff I don’t actually need. Sometimes it’s really hard to get rid of things, even if it gets us closer to our goal of living simply and having less. I like this blog! Not as much about the music and ridding your space of physical stuff, but the connection to memories and sweet love between you and your hubby. Too cute! I know exactly how you feel Claire! I’m a hoarder, I hate to admit it but I am! I’ve dragged useless boxes of sentimental junk around with be for years. Through six different houses and apartments, shoving it at into whatever space is available and never looking at it again, it’s like I’m bringing my own walls with me. Right now my office is bulging, the ceiling is sagging from everything I have in the attic and really, if it suddenly disappeared from the earth, I wouldn’t be able to tell what was in it and I’m sure I wouldn’t miss it – but I still hang on to it. Why? A while ago I tried to get rid of ten years worth of film magazine. I never look at them, I never read them twice, I have no use for them what with the internet, and they are Heavy! I stacked them by the door along with a bunch of clothes and furniture a while back ready for pick up by a local charity chop, when they called I said “Everything but the magazines, thanks” back up to the attic they went. At Christmas I thought I’ll donate them to a local college to add to their reference library, I wrote the email… just wrote it, there was no sending involved! Like you I think about the years of investment, the time, money and enjoyment they brought me (along with everything else I possess) I guess it’s a form of nostalgia, where those moments and feelings are fleeting. But rather than embrace them for what they are, a fluttering butterfly that only lives a day or two, we grab hold of it, stick a pin in it’s back and put it in a case to look at forever… Still beautiful to look at but it doesn’t quite have the same magic when it isn’t dancing in the air. We need to learn to let it flutter by. As Tyler Durden once said “The things that you own, end up owning you.” I know only too well what that means! I think I’ll have a clear out! I couldn’t agree with you more, Frank! Well put indeed. Learn to let it flutter. Good luck with the clear out! I like things and can usually connect everything I own to something. And that’s the reason I have a hard time getting rid of stuff. I admit I have some hoarding tendencies, but I have gotten better over time! I commend you living for less and I aspire to be more like you! I can relate with your blog and find that music is the hardest thing for me to get rid of. I have always had a connection with music and love how it can evoke emotion and thought. If I hear a certain song, I can be immediately transported back in time to a specific moment with vivid memories and thoughts. I remember awhile back I got rid of some CDs that I hadn’t listened to in years. We were running out of space and I couldn’t justify having them around anymore since all they were doing was collecting dust. As I looked at my box full of music memories, I found myself contemplating if I was making the right decision to let these treasures go. But then I thought about it more and realized they weren’t doing any good on my shelf or living up to their full potential. So I let them go, reluctantly, so someone else could enjoy them as I had. As Frank mentioned, I should learn to let it flutter. It’s hard to do at times, but worth it in the end. Music and scent for me are both time travel devices. They can transport me anywhere in my memory. I’m with you on the memories for sure! See, I compromised and just got rid of the jewel cases. I wasn’t quite prepared to part with the actual discs. This is mostly due to the fact that I still have to listen to CDs in my car because I don’t have an aux. jack…and I kind of love the idea of using the sleeve art to make something in the future (you know…cause I’m so crafty). But yes…it felt GREAT throwing out all those jewel cases. I just wish we could have recycled them. It would have felt even better. Have you listened to Tennis? I feel like you might love them too. Just a little. Now you’re good at making mixed Cds for friends! You’ve definitely earned at least a Masters in music albums, while I am still working away at my GED. Which reminds me… I have a bunch of Cds I don’t listen to (mostly from high school) and should get rid of… but I’m too embarrassed to transfer them to my computer or Ipod! How bad is that? It’s like I don’t mind hiding them in a box and listening to them once in a blue moon, but I would be mortified if someone actually heard Third Eye Blind, Aqua or Michael W. Smith come up on a playlist. So they’re safe in the dark, unused!!! I read your “about” page & like the purpose of your blog. I too am a midwest (MI) girl in a city yard who loves to garden. Thanks for the inspiration!